The National Medal for Museum and Library Service is the nation’s highest honor given to museums and libraries by the Institute of Museum and Library Services in recognition of exceptional service to the community and for making a difference in the lives of individuals, families, and communities. And the Honolulu Museum of Art has been named as a finalist for the 2016 National Medal award! This year’s finalists include individual public libraries, university libraries, science, history, and children’s museums, and many other types of institutions that reflect the diversity of libraries and museums across the country. This honor recognizes the contributions of our programs such as Neighboorhood School Partnership, Art to Go, the Celebrate Micronesia Festival, Guided School Tours (pictured above), and Soundshop to O‘ahu. As part of the National Medal’s celebration of institutions that are committed to community service, IMLS is featuring the Honolulu Museum of Art, along with the other 29 finalists, on social media platforms and invite the public to Share Your Story on the IMLS Facebook page. Visit the IMLS Facebook page and Share Your Story today! 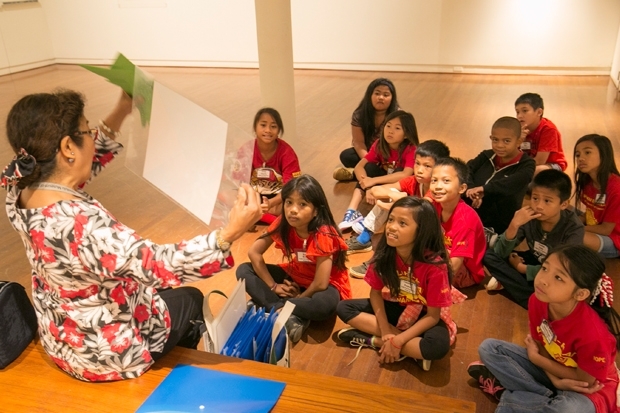 We look forward to reading the ways Honolulu Museum of Art is part of your life. The Honolulu Museum has made a major difference in my life as an artist. I moved to Hawaii in 2008 and became a resident. In 2012 I was accepted as one of 11 artists from the state of Hawaii to participate in “Artists of Hawaii 2013″ at the Honolulu Museum of Art. The museum purchased one of my three installations for their collection and I won a major 3-D design away during the exhibition. To have this recognition at my age (77) has made my a huge difference for me, enabling me to thrive as an individual artist.